Map showing epicenter of major earthquake that hit offshore of Japan's Honshu island on 11 March 2011. 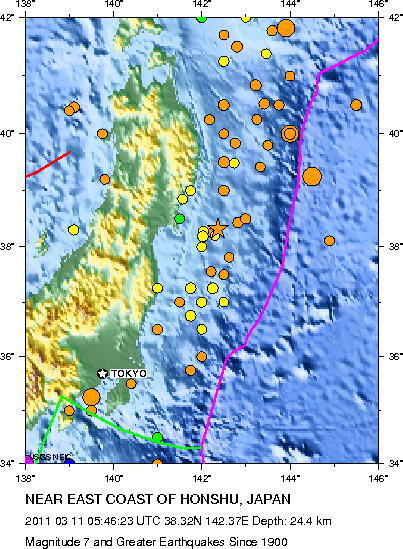 On 11 March 2011 at 12:46 a.m. EST (05:46:23 UTC) a major earthquake, preliminarily measured at a magnitude of 8.9 occurred near the Japan Trench in a subduction zone, where the Pacific plate thrust underneath the North America Plate where Japan is located. The earthquake hit at the rather shallow depth of 24,4 kilometers [15.3 miles] near the coastline of Sensai, generating a tsunami that began impacting more than 2,100 kilometers of the eastern coast of Japan’s main island of Honshu, just a few minutes after the earthquake itself. Given the high magnitude of the earthquake the resulting tsunami was expected to impact Alaska and the west coast of Canada and the USA as well as Hawaii. Initial reports indicated 32 death from the earthquake and following tsunami, but this number is expected to climb as reports come in from a long stretch of densely populated coastal region to the north of Tokyo. Map showing all magnitude 7.0 or greater eartquakes that have hit the northern Honshu, Japan, region since 1990. The area where this earthquake hit had seen a series of quite strong, magnitude 6.0 to 7.2, foreshocks starting on 9 March, a day where one 7.2 earthquake and three 6.0 shocks took place near the epicenter of today’s major quake.This map shows the northern portion on Honshu island in Japan, to the north of Tokyo, and the Japan Trench identified by a purple line. Each color dot represents a magnitude 7.0 or greater earthquake in this region since 1900. The orange star pinpoints the 8.9 magnitude 11 March 2011 earthquake. The northern portion of Japan’s Honshu island has quite a history of seismicity with several magnitude 7.0 or greater earthquake having taken place since 1900. So the frequency of recurrence for major earthquakes is high as is the vulnerability of the region, in especial the eastern coastal region of Honshu. The considerable risk of earthquake damage faced by northern Honshu is best illustrated by looking a seismic map of the region showing all earthquakes magnitude 2.5 or greater, which have occurred since 1990, that is just over 20 years! Map showings all 2.5 magnitude and greater that have hit the northern Honshu, Japan region since 1900. 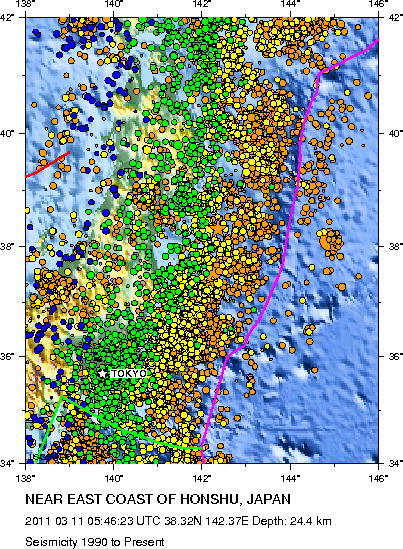 The region where the 11 March 2011 earthquake hit is one of the most active sections of what is known as the Pacific “rim of fire”, which follows the boundary of the Pacific tectonic plate and a few other smaller plates, such as the Cocos, Nazca and the Philippines, as they interact with other plates such as the North America, South America, Australian and the Eurasian. As these plates move past one another, or one under the other [subduction], friction makes the rock on each side of the boundary basically stick together until the force generated by accumulated energy is such that it overcomes friction and a rupture occurs. These boundaries between plates where these ruptures occur are know as seismic faults, or to put it simply: breaks in the crust of the Earth. In addition to generating most of the earthquakes on Earth, plate boundaries and seismic fault are also associated with the building of mountain ranges, volcanoes and islands. 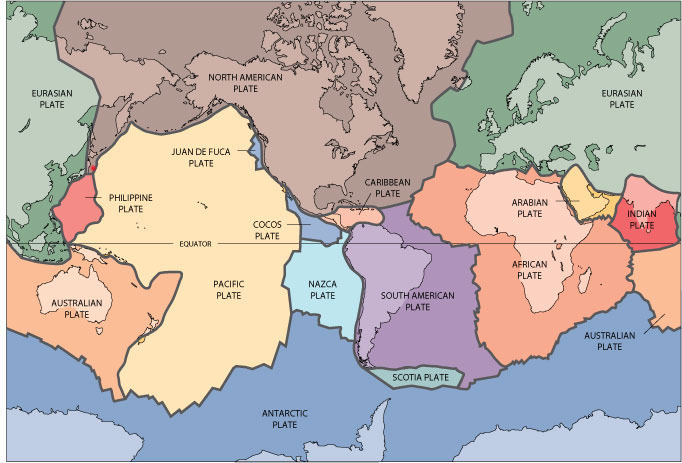 Map showing the several tectonic plates comprising the crust of the Earth. The red area near Japan at the boundary between the North America and the Pacific plates is where the major 8.9 magnitude earthquake of 11 March 2011 occurred. It is clear we will have to monitor the aftermath of this events, the earthquake and the tsunami, closely to assess how much damage and loss of life and injury takes place. We could expect the death toll to climb in Japan as preliminary damage assessments are completed by civil defense and emergency management teams, and physical or structural damage to coastal locations around the Pacific ocean to mount as the tremendous amount of energy released by the break in the seismic fault, which generated the tsunami, expands in subsequent concentric rings (as you get when you drop a pebble in a pond) and generates multiple impact waves over a period of minutes or hours on coatal regions around the Pacific. This map illustrates the so-called Pacific Rim of Fire. Notice the point where the North American, Pacific, Philippines and Eurasian plates come together and how much major earthquake activity takes place there. That is the region where the 11 March 2011 earthquake hit. As with other major impacts by a natural hazard, today’s event presents us with invaluable opportunities to learn. From how much prediction was available, to the roles of response and recovery efforts, and especially how effective the numerous mitigation measures Japan has implement over the years through building codes and standards and methods of construction. we will have unique opportunities to evaluate what worked or not, and why. No amount of simulations or experimental work can replicate what nature has done and the value of directly observing the impact and consequences…..this is the value of the empirical aproach to risk management.